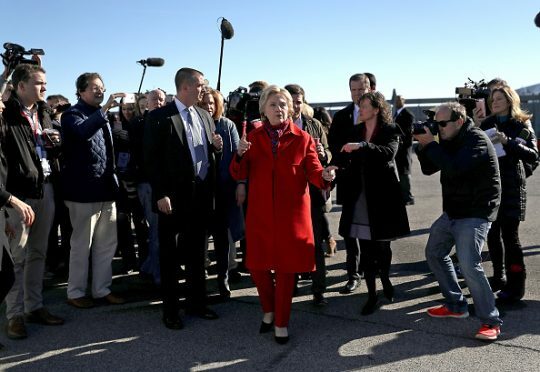 Warner Bros. Television has acquired the rights to New York Times reporter Amy Chozick's memoir of covering Hillary Clinton's two presidential campaigns, to develop as a television series. Warner Bros. won a competitive battle to option the TV rights for Chasing Hillary: Ten Years, Two Presidential Campaigns, and One Intact Glass Ceiling, Deadline reports. It is Chozick's bestselling account of being on the trail with Clinton during her failed bids for the White House in 2008 and 2016. Her own newspaper's review called it a funny, enjoyable read, like "The Devil Wears Prada" meets "The Boys on the Bus." It also noted Chozick clearly admired Clinton and took it personally when Clinton would freeze her out. A Washington Post review made note of Chozick's fixation on whether Clinton liked her and the writer's constant complaints about anonymous New York Times colleagues. She also wrote scathingly about males on Clinton's staff who she said had sexist and sycophantic attitudes, including Philippe Reines, a "possible sociopath." While mainly a memoir of Chozick's own experiences, the book also delves into the candidate and the campaign's suspicious attitude toward the media and the caginess that ultimately helped Clinton lose to Donald Trump. Chozick wrote she "cried" after finishing the story about how Clinton lost to Trump. This entry was posted in Culture and tagged Hillary Clinton, New York Times. Bookmark the permalink.